March is finally here, and we are getting closer to spring in the Queen City. It’s a month for spring break, spring cleaning and the promise of warmer days. To make the transition from winter to spring, we scouted out some great new March FINDS at some of Charlotte’s best boutiques. Take a look! We don’t know about you, but we typically stick to black and grey neutrals throughout the winter months. If you’re ready to add a little color to your wardrobe, check out this fire-red pom skirt, $38, from Frock Shop. It can be purchased in the store or online. Sparkle, flowers and drama. Spring jewelry selections, like this one, are out in stores, and we couldn’t be happier! You can find the necklace for $35, bracelet for $60 and earrings from $35 to $42 at CLTCH in Plaza Midwood. Sometimes you only need one statement item to spice up an otherwise basic outfit. For that, we recommend these fun pieces from Loeffler Randall that you can find at Sloan Boutique. The tassel-adorned shoes are $295, and the bold clutches run from $220 to $225. Turquoise is one of spring’s staple colors, and this Charleston Rice Bead bracelet is a simple way to easily incorporate the color trend into your style. This accessory is made with the modern woman in mind and can be stacked for added arm candy. Find it at StyleBlueprint Charlotte’s own SB Shop for $32. Whether you are staying in Charlotte or heading somewhere tropical for spring break, represent your city! From apparel to merchandise, Glory Days Apparel has all of your Charlotte essentials, and we love this slouchy Charlotte heart t-shirt for $30. Elsa Fine is known for unique accessories and flirty dresses. This embroidered dress, $44, is perfect for spring in classic red and blue. Paired with this straw summer bag, on sale now for $10, it’s the ideal look for spring! 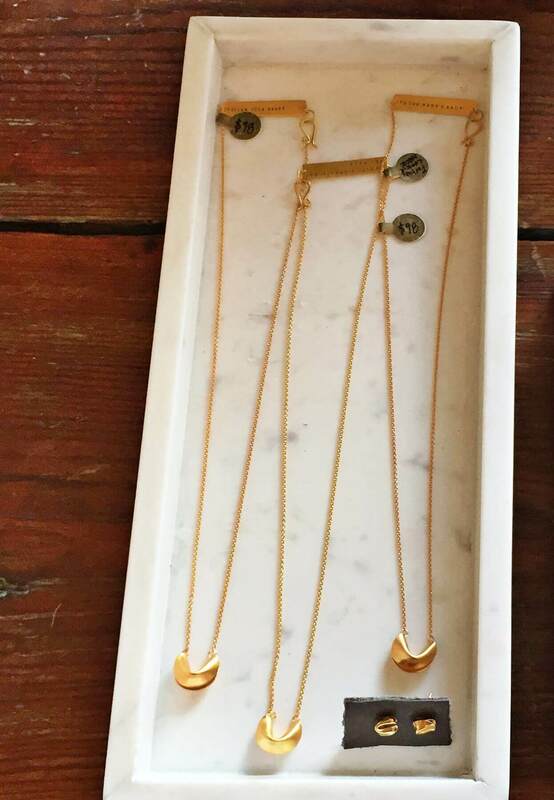 We are in love with these Christina Kober necklaces, $98, at Moxie Mercantile. Each necklace has a different fortune, like “follow your heart” and “magic is something you make,” making them feel special and unique – great for gift-giving! We love browsing the unique and well-curated finds at TUFT. This beautiful grey vintage dresser for $650 is a fun spring refresh for a bedroom or living area in your home. The sleek and stylish piece caught our eye immediately! Is there anything better than snuggling on your couch with a soft blanket while watching your favorite show? We’re sure there is, but we can’t think of anything right now. This colorful and soft blanket from Lands Downunder can be found for $105 at abode. Vestique, located in Dilworth, has an adorable selection of gifts for brides-to-be. Send the bride to her honeymoon with this hat, $16, or surprise your recently engaged friend with this adorable ring tray for $12. Savory Spice Shop in South End is a deliciously scented shop stocked with all the spices and seasonings needed for cooking … but we love their drink mixes! The made-in-house cocktail mixes are perfect for backyard get-togethers with friends this spring. Prices range from $7.50 to $10 depending on the mix. From new releases to classics for $2, the vinyl selection at Lunchbox Records is impressive, and you’ll find yourself looking through the stacks for hours. They also sell CDs and cassettes – yes, cassettes! An average new release is about $30, but don’t miss out on their $1 bins. Whether you’re headed out of town or logging some hours spent outdoors in Charlotte, tunes are essential for time in the sun. We love the Sunnylife Beach Sounds portable speaker, which is as cute as it is functional. If you are staying home, the Ginormous Unicorn Sprinkler is perfect for backyard fun. Both the Sunnylife speaker and the sprinkler are $50 and can be found at Girl Tribe Co.
Sunnylife speaker and sprinkler, $50 each, at Girl Tribe Co. Happy spring, and happy shopping! Keep up with all the great FINDS we spot around town — follow us on Instagram!